Doorbell functions Danmini 4.3 inch color digital peephole viewer with remote Introduction: At home mode:When a visitor presses the door bell button, the machine will ring the door bell. Out of home mode: When a visitor presses the door bell button, the machine will tip "the owner is not at home, please press again, to the master message" NO disturb function : When a visitor presses the door bell button, the machine NO ring the door bell, and automatic camera store visitors. After the machine to take pictures or video, the film images stored in the TF card, you can browse items or browse using a card reader in the computer via the menu When the house presses the switch button, the machine will open and display all outdoors on the big screen When the machine is turned on, the screen is displayed on the screen door, the house staff press the watch key to complete the pictures, the screen will automatically be stored in the TF card. press monitor button to see and take photo of the scene outside at anytime you want. hold on the monitor button for seconds without lose until screen turn on, then don't disturb funtion asjustment has finished. at a same way, hold on the monitor button until screen turn on,then don't disturb funtion has cancel. 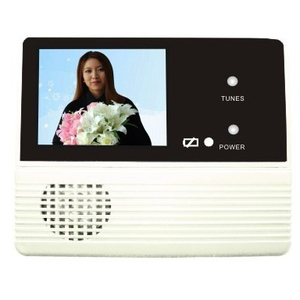 Shenzhen HaoYu Hang Tech Co., Ltd.
WiFi Vedio Smart Doorbell connects to network via Wifi router or network cable. Mobile devices including smartphones or tablets, could connect to the doorbell remotely. Support 8 users to moniter one video doorbell at the same time, also have one indoor bell receiver included(wireless). The indoor machine bells ring and the display lights off. Taking picture or recording video automaticallyNo disturb Mode. The indoor machine bells won&rsquo;t ring and the screen lights off. the battery can be replaced without removing the host or cat's eye, by direct open the host plane battery cover. 3. Indoor unit with battery display function, battery remainder will alert user when the power reserve is low. Tips: When the unit is not used for a long time, remove the batterires to avoid battery leakage. Shenzhen Simtoo Intelligent Technology Co., Ltd.
can record video or taking pictures automatically by motion detection. 7. Video Recording: Press Video button, the device will record video. Repeat press Video button it will stop the video recording. 1. Features: &bull; The operation is easy , only to press the monitor or call button to start the device. 1. We can offer the samples free for testing, and the customers should pay the freight. We make sure the highest quality is maintained from incoming materials to finished products. when you press doorbell, it will take 10s video in the TF card. 9. Rechargeable battery can last for 2 months after once a charge. Once someone damage the camera and try to pull it out, it will make alarm sound. 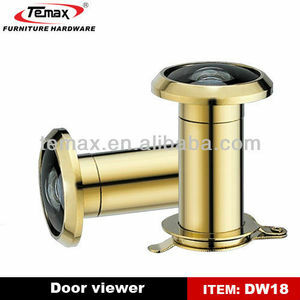 Alibaba.com offers 4,763 door viewer camera products. About 23% of these are door viewers, 12% are cctv camera, and 1% are video camera. 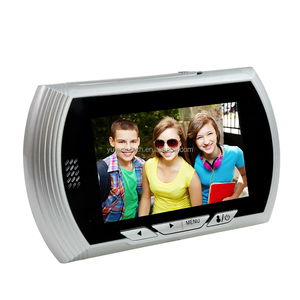 A wide variety of door viewer camera options are available to you, such as 160 degree, 180 degree, and 220 degree. You can also choose from aluminum, zinc alloy, and stainless steel. As well as from paid samples, free samples. There are 4,684 door viewer camera suppliers, mainly located in Asia. The top supplying countries are China (Mainland), India, and Hong Kong, which supply 99%, 1%, and 1% of door viewer camera respectively. 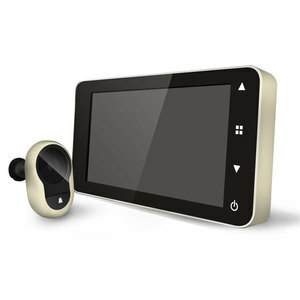 Door viewer camera products are most popular in Western Europe, North America, and Northern Europe. You can ensure product safety by selecting from certified suppliers, including 358 with ISO9001, 179 with Other, and 26 with ISO14001 certification.